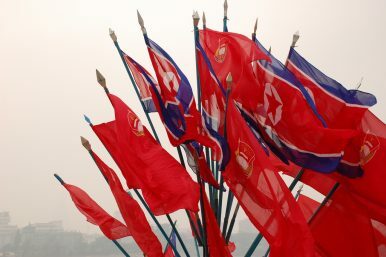 North Korea is experimenting with new types of coercive bargaining. If you thought the “August crisis” between the United States and North Korea ended when Kim Jong-un decided not to proceed with the launch of four missiles towards Guam, you may be disappointed. In fact, the coming days hold the key to the whole affair, which is an example of Kim experimenting with the kinds of coercive bargaining opportunities his new long-range missiles give him with the United States. Even a perfunctory reading of North Korea’s original threat to strike the waters near Guam with four Hwasong-12 intermediate-range ballistic missiles, released on August 8, makes clear that Pyongyang never committed to any action. Instead, Kim Rak-gyom, the head of North Korea’s strategic ballistic missile development programs, said that he would present Kim with a plan in mid-August. This occurred on August 14, North Korea’s official news agency reported, when Kim Jong-un reviewed maps showing a missile trajectory to Guam from what appeared to be the North Korean coastal town of Sinpo – where Pyongyang conducted failed launches of the Hwasong-12 in April. Amid broader concerns about the nature of North Korea’s threat, what was lost was the conditional offer for de-escalation that Pyongyang included in each of its statements. The impulse to strike Guam, Pyongyang noted, was out of necessity, not any sort of irrational fury. North Korea regularly protests against the United States’ flights of strategic bombers, most notably the B-1B Lancer. U.S. Pacific Command’s bomber mission is headquartered in Guam. The United States thinks that the non-nuclear status of the B-1B will cap tensions with Pyongyang, but North Korea does not believe U.S. claims about the aircraft, seeing it as a strategic nuclear weapon delivery platform, like the B-52 and B-2. Ultimately, Kim Jong-un’s entire Guam gambit is built around an attempt at forcing the United States’ hand through the threat of long-range missiles – cease your bomber flights to the Korean peninsula or we will strike at waters near Guam. North Korea has also requested a modification of the upcoming U.S.-South Korea computerized command post military exercises, which it sees as a ruse for war by the alliance. The threat to strike the waters near Guam is a nasty and unproductive way to approach a prospective negotiating partner, but it is true to North Korea’s style. Is Pyongyang likely to go through with the plan to strike near Guam immediately? Probably not. It would be the most provocative action that the North would have taken against the United States since the end of the Korean war in 1953. However, given how North Korea has framed the Guam gambit, there is no loss of credibility either for Kim. By never having committed to launching the missiles in the first place, merely reviewing the order, Kim can now walk himself back and show restraint by withholding authorization for the launches. Despite the potential for escalation and miscalculation here – especially with the current U.S. president’s tendency to fire from the hip, even when talking about nuclear weapons – Kim has succeeded in putting the ball in the United States’ court. If Washington wishes, it can seize the opportunity to test North Korea’s willingness to submit to a voluntary moratorium on ballistic missile testing as the first step to even exploratory talks on the broader questions surrounding the country’s missile and nuclear programs. Doing so, however, would require the United States to reconsider B-1B flights temporarily and submit to changing the forthcoming military drills with South Korea. Some reports already suggest that modifications may have been approved for this year’s exercises. North Korea’s Guam gambit, thus, is far more complicated than it may have initially seemed. The window for a mutual drawdown and potential talks is narrow, but it is here. While it would take a degree of perhaps unwarranted optimism to expect the Trump administration to see this opening, failing to at least entertain opportunities like these can later be a source of great regret. This article first appeared at the South China Morning Post. It is republished here with kind permission.